Don't know anything about this other than that it was the Kennerspiel des Jahres winner. Anyone got it, played it, like it, hate it? SamVS wrote: Don't know anything about this other than that it was the Kennerspiel des Jahres winner. I've played Exit:The Abandoned Cabin, all 3 Unlock games (which come in 1 box) and also the 2 Thinkfun ones, Stargazers Manor and Dr Gravely. 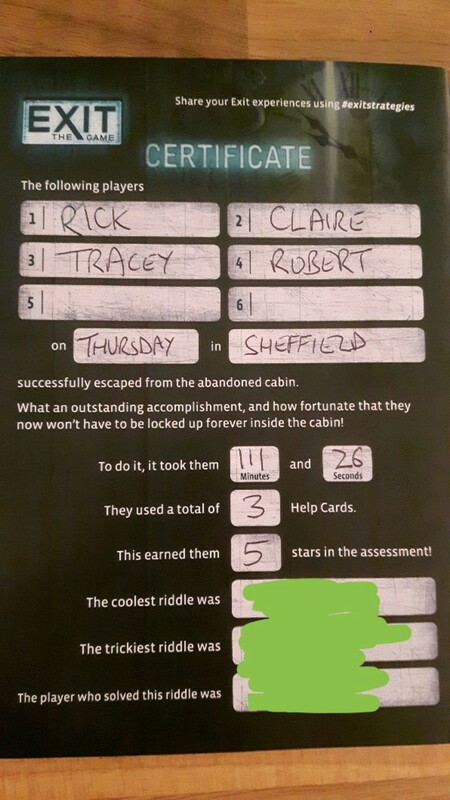 4 of us played the Exit game and we all really enjoyed it, my friends wife played and she's not really into games but she messaged me the next day to say thanks and she really enjoyed it. She compared it to a D&D adventure because it has a bit of a story (but it's not a role playing game). puzzle that had the rest of us scratching our heads. Really enjoyed it, definitely worth a play. I'm gonna get the other 2 Exit games at some point. By the way there's an escape room game in the club library if you want to try one. RikTheChief wrote: By the way there's an escape room game in the club library if you want to try one. Is that one playable on a club night do you think? Yes, takes about an hour. I wanted to get one or two of the EXIT games to try but I missed them all at the expo and they haven't been in Patriot Games. I could order them but haven't got round to it. All I've tried so far in this genre is a couple of scenarios of Unlock. They're pretty good, although Polly and I felt a bit frustrated with a couple of the puzzles. That might be us being a bit rubbish and/or unobservant, though and there are clues there to help you over any bumpy patches. It does help if you've got someone with perfect vision to look at some of these cards, which isn't either of us. Overall we enjoyed them and the variety of different puzzles was impressive. There's no component destruction in Unlock, unlike EXIT, so I could bring them in for people to try one Tuesday. BeardyTom wrote: I wanted to get one or two of the EXIT games to try but I missed them all at the expo and they haven't been in Patriot Games. I could order them but haven't got round to it. BeardyTom wrote: There's no component destruction in Unlock, unlike EXIT, so I could bring them in for people to try one Tuesday. Yes, I'd quite like to have a go at one, they sound quite interesting, and I do like a bit of puzzle solving.